Karen Kusiak grew up in a family where hard work and always doing her best was championed. Her family worked hard to send her brother and her to college – the first of their generation to attend and complete a degree at a 4-year college. Kusiak has had an interest in understanding and supporting folks who did not have the same advantages she had throughout her life. This interest in supporting other people drew her to teaching and to community and public service. 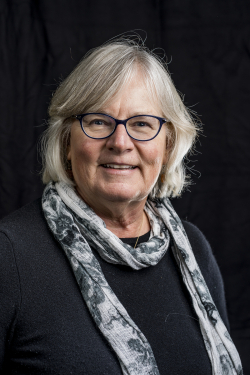 Kusiak is running for Senate because she believes it’s about time that politicians in Augusta start listening to Mainers and respecting the will of our voters. Mainers voted to give more state money to our public schools to provide reliable funding for our students and to ease the burden on property tax payers. Mainers voted to expand access to affordable healthcare in our state for those in need. Mainers voted for a living wage for ALL our workers. Maine voters have clearly spoken on these issues, but in Augusta, legislators have decided that our voices don’t matter. 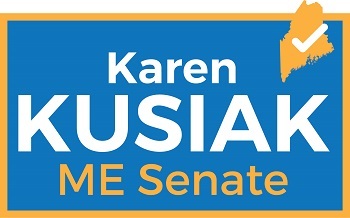 Karen Kusiak is running to make sure that when Maine voters speak, Augusta listens. The Legislature must maintain Mainers' access to vote. 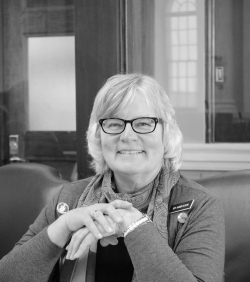 Town clerks in Maine work hard to ensure secure elections. Investments in early childhood education support working families and advantage communities by preventing costly interventions in later school years. Work force education and training will support working and middle class families. Working people need to earn a living wage. Maine needs to invest in clean energy and support homeowners and businesses that invest in clean energy. State policies must be in place to ensure clean air, rivers, lakes, and oceans during a period of loosening of federal regulations. Affordable education and training for skilled employment will enhance the lives of people in Maine and provide the support young Mainers need to live and raise their families here. In the current period of deregulation of Educational Policy at the Federal level, state legislatures must remain firmly in support of policies that support strong public education. Privatization of the public system of education and of the system of teacher education reduces the quality of education. Paid for by the candidate.